When installing Mozilla Minefield (Firefox daily builds) on Ubuntu, it automatically creates a new profile and copies your current profile there. But on Windows this thing doesn't happen. Sync add-on is disabled because it is build in Firefox now. Recommendation: do not sync your stable release with any beta/daily builds. I did this and after a while I got an error from the stable release that said I should update Sync, but there was no update available. So Sync didn't work for a while. This happened to me with Minefield b7. The biggest problem is Firebug. The beta release (1.6) that works with Firefox 4 is buggy, becomes unusable sometimes and crashes the browser. Save and open Firefox with that shortcut. 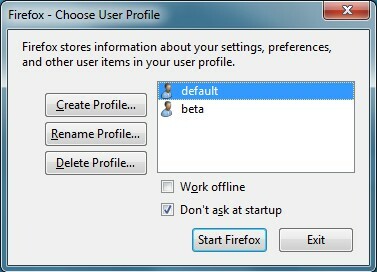 The profile manager windows should appear (image bellow), click on Create Profile and create the "beta" profile. UPDATE: Another way to solve this is to install the portable version of Firefox beta.